Kiran Bedi (born 9 June 1949) is an Indian social activist and a retired Indian Police Service (IPS) officer. Bedi joined the police service in 1972 and became the first woman officer in the IPS. 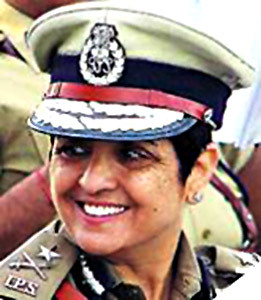 Bedi held the post of Director General at the Bureau of Police Research and Development before she voluntarily retired from the IPS in December 2007. Bedi was the host and judge of the popular TV series "Aap Ki Kachehri" (English, "Your Court"), which is based on real-life disputes and provides a platform for settling disputes between consenting parties. She has also founded two NGOs in India: the Navjyoti Delhi Police Foundation for welfare and preventative policing in 1988which was later renamed as the Navjyoti India Foundation in 2007, and the India Vision Foundation for prison reformation, drug abuse prevention and child welfare in 1994. Bedi was awarded Ramon Magsaysay award in 1994 for Government service. Kiran Bedi was born in Amritsar, Punjab, India. She is the second of four daughters of Prakash Peshawaria and Prem Peshawaria. Her three sisters are; Shashi, an artist settled in Canada, Reeta, a clinical psychologist and writer, and Anu, a lawyer. (Hons.) from the Government College for Women, Amritsar in 1968. She then earned a Master’s degree in Political Science from Punjab University, Chandigarh, graduating at the top of her class in 1970. She later obtained Bachelor of Laws in 1988 from Faculty of Law, University of Delhi. In 1993, she obtained a Ph.D. in Social Sciences from the Department of Social Sciences, Indian Institute of Technology Delhi where the topic of her thesis was 'Drug Abuse and Domestic Violence'. She began her career as a Lecturer in Political Science (1970–72) at Khalsa College for Women, Amritsar. In July 1972, she joined the Indian Police Service, becoming the first woman to do so. Bedi joined the police service "because of [her] urge to be outstanding". She served in a number of tough assignments ranging from New Delhi traffic postings, Deputy Inspector General of Police in Mizoram, Advisor to the Lieutenant Governor of Chandigarh, Director General of Narcotics Control Bureau, to a United Nations delegation, where she became the Civilian Police Advisor in United Nations peacekeeping operations. For her work in the UN, she was awarded a UN medal. She is popularly referred to as Crane Bedi for towing the Prime Minister Indira Gandhi's car for a parking violation,during the PM's tour of United States at the time. Kiran Bedi influenced several decisions of the Indian Police Service, particularly in the areas of narcotics control, Traffic management, and VIP security. During her stint as the Inspector General of Prisons, in Tihar Jail (Delhi) (1993–1995), she instituted a number of reforms in the management of the prison, and initiated a number of measures such as detoxification programs, Art of Living Foundation Prison Courses, yoga, vipassana meditation, Murat redressing of complaints by prisoners and literacy programs. For this she won the 1994 Ramon Magsaysay Award, and the 'Jawaharlal Nehru Fellowship', to write about her work at Tihar Jail. In May 2005, she was awarded an honourary degree of Doctor of Law in recognition of her “humanitarian approach to prison reforms and policing”. On 27 November 2007, she expressed her wish to voluntarily retire from the police force to undertake new challenges in life. On 25 December 2007, the Government of India agreed to relieve Bedi of her duties as Director General of the Bureau of Police Research and Development. Kiran Bedi is one of the prominent members of the India Against Corruption (IAC) along with Anna Hazare and Arvind Kejriwal. IAC has been actively protesting against corruption and is urging the government of India to enact a strong Lokpal Bill. On 16 August 2011, Key members of the India Against Corruption including Bedi were arrested four hours before the planned indefinite hunger strike by Hazare.However, Bedi and other activist were later released in the evening same day. After twelve days of protests and many discussions between the government and the activists, Parliament passed a resolution to consider three points in drafting of Lokpal bill. Kiran Bedi, has been India’s first and highest (woman) ranking officer who joined the Ind ian Police Service in 1972. Her expertise includes more than 35 years of creative and reformative policing and prison management. She holds a Law, Masters, Doctorate degree. She is also a Nehru Fellow (post doctoral) -- Been a National and an Asian Tennis champion. She has addressed audiences at the American, British, European, Indian Universities, Corporate and Civil Society groups. In July 1993, Kiran Bedi, the then Inspector-General of Prisons of Tihar Jail was pulled up by the Supreme Court of India for ignoring the apex court directives for providing medical attention to a foreign under-trial prisoner by initiating contempt proceedings against her. In 1988 Wadhwa Commission criticised Bedi for her role in lathi-charge on lawyers protesting against a colleague’s arrest outside Bedi’s office. Karan Thapar, host of many popular interview shows published an article on controversies surrounding Bedi after she pulled out of one of Thapar's interview show. Bedi was criticised for being a hardliner in the negotiations with government over Lokpal bill. Later members of parliament proposed to bring a breach of privilege motion against Kiran Bedi and a few other activists for allegedly mocking the parliamentarians during the lokpal bill protests, however withdrew the notice later. Kiran Bedi was alleged to have charged her hosts full fare for air tickets despite her paying discounted fare. She was also alleged to have charged her hosts business class fare while flying economy class and presenting false invoices. Bedi was also accused by an NGO of claiming business class fare from Delhi to Mumbai, while her travel intineray communicated to them showed she was flying from nearby Pune.Kiran Bedi has said that money was not earned for personal gains, but given to her NGO. In 1992 Kiran Bedi's daughter was given admission for MBBS course in Delhi's Hardinge College under a quota for student's from North-East. Kiran Bedi was posted in Mizoram at that time. She had defended the move to get her daughter admitted in a reserved seat saying that Central Government employees are entitled to such schemes. On 26 November 2011, based on a complaint filed by a Delhi-based lawyer Devinder Singh Chauhan, the additional chief metropolitan magistrate Amit Bansal has directed the crime branch of Delhi police to register a case against Kiran Bedi within 24 hours, for allegedly misappropriating funds meant for her NGOs. Consequently, Delhi Police has registered a case against Bedi under Section 420 (cheating), 406 (criminal breach of trust), 120 b (criminal conspiracy) of IPC. India's first woman IPS officer Kiran Bedi has decided to quit the uniform. In her application to the Union Home Ministry submitted a few weeks ago, Bedi has cited pursuant of "strong academic and social interest" as the reason for seeking voluntary retirement from service. The application is now under the consideration of the ministry. “I have requested the government to grant me voluntary retirement,” said Bedi. When asked if she quit because she was superseded for the post of Delhi Police Commissioner in July, Bedi said that was a thing of the past and she had moved on since then. “I have gratitude for the police force and all the people,” she added. Bedi, a 1972 batch IPS officer of the UT cadre, emerged as a strong contender for the coveted post of Delhi Police Commissioner held by K K Paul in July this year. But the Centre overlooked highly decorated police officer to name a junior IPS officer, Yudhvir Singh Dadwal, as the new Police Commissioner of Delhi, inviting sharp reaction from the country's first woman IPS officer. Sources in the Government say Bedi was overlooked because she has not been in active policing of late but the celebrated officer thinks otherwise. “I have raised my own standards for a new challenge,” added Bedi, who is the Chief of the Bureau of Police Research and Development. A non-profit organisation in Mumbai has accused Team Anna member Kiran Bedi of claiming travel expenses far in excess of what she actually incurred to attend a programme organised by them in 2009. George Abraham, general secretary of the Aviation Industry Employees Guild, said his organisation had invited Ms. Bedi to be chief guest for an International Women's Day function in Mumbai in March 2009 and that she had accepted the invitation. But she over-invoiced the Guild for her travel expenses, Mr. Abraham told The Hindu on Monday. He added that his organisation realised they had been given a false invoice only after The Indian Express published a story accusing Ms. Bedi of discrepancies in her travel accounts. According to Mr. Abraham, her travel agent, Flywell, had sent the Guild an invoice for Rs. 31,578 for a return ticket to Delhi by Indian Airlines. The travel was by executive class and the Guild sent a cheque for that amount. However after The Indian Express news story, the Guild checked its old records and found a message giving the travel details of Ms. Bedi for that trip. A message they found in the files said she was arriving by a Jet airways flight from Pune. According to media reports, the owner of Flywell, Anil Bal, is a co-trustee of Ms. Bedi's NGO, India Vision Foundation. Mr. Abraham said that Ms. Bedi attended another function at an educational institute in Mumbai the same day and added that there is every reason to suspect she may have charged them for her travel as well. “There is an element of dishonesty for a person of her status”, he said. In subsequent SMSes, Ms. Bedi said: “How is this relevant? It was an offer by them and I did a favour by going to them free, not charging even a speaker fee. Ask them, did I ask for invite or they invited me? And whose behest are they talking of?...Whose interest is this nonsense going on?...Team Anna is becoming stronger by this I can tell you. Come what may, we have to get the Jan Lok Pal Bill...Since when did saving become a crime?" "she is very great IPS offecer"